Eleven miles northwest of Boston sits Lexington, MA. This modern, bustling suburb is famous internationally as the site of the Battle of Lexington, the first formal military conflict of the American Revolution. Easily accessible by car, Lexington is the perfect spot for a day trip, featuring plenty of indoor and outdoor activities that celebrate the city's unique history and heritage and explore suprising aspects of this foundational episode in American history. Lexington Green--the site of the first battle of the American Revolution--is an essential stop for any visitor. During the summer months, the Green is staffed by costumed guides who provide free tours and are a wealth of knowledge about the history of Lexington. In April, the Green is the site of the annual Patriots' Day reenactment of the Battle of Lexington, an event that draws crowds from all over New England. 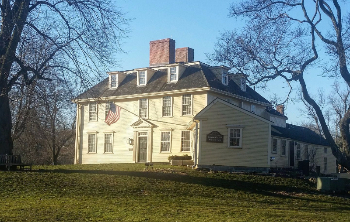 The Lexington Historical Society maintains three historic houses that are open to the public--Buckman Tavern, Monroe Taven, and the Hancock-Clarke House. Through a combination of tours, films, costumed interpretation, exhibits, and events, the Historical Society presents this well-known story in a way that is always fresh and engaging. "We see a really wide range of visitors with varying levels of knowledge about the Revolutionary War," explains Chris Kauffman, Manager of Education and Interpretation at the Lexington Historical Society. "Some people are huge history buffs, but a lot of visitors just remember learning about Lexington in the fifth grade. They know that something important happened--we try to fill in the blank spots." Buckman Tavern is the most-visited of the three properties. The tavern was built in 1710 and functioned as an important gathering place for the community. "Buckman Tavern was the de facto headquarters for the Lexington militia," Kauffman says. "It is located right across the street from the green, so it's a great spot to focus on the militia's side of the story. We talk about the lead-up to the battle and tell the story of the minutemen." 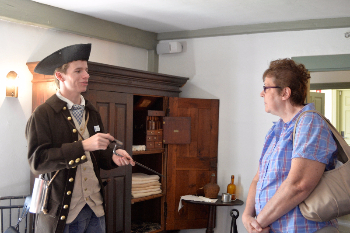 The stories told at Buckman Tavern are much more than a summary from a history textbook. "I want people to learn about the sacrifice and courage that our forefathers had to be able to stand up to the British army," Kauffman says. "Most were farmers and had no military training, and they were severely outnumbered, and yet they were able to stand up in the face of the best-trained army in the world." 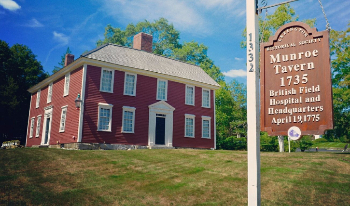 Monroe Tavern, built in 1735, presents a different version of the familiar story. "Monroe Tavern was taken over by the British army and used as a field hospital," Kauffman explains. "We really delve into the British experience and it opens up a lot of eyes. The British soldiers who came here weren't really sure about what was going on--they were marching into the countryside in the middle of the night and not told where they were going. When they arrived, they had been marching for six hours and were not supplied for a full-stage battle. It was a really tenuous situation, and so we encourage visitors to picture themselves as a British soldier." Even the most committed history buff might learn a thing or two after a visit to Lexington. "One of the biggest misconceptions that visitors have relates to what Paul Revere said during his famous ride," Kauffman explains. "Everyone thinks that he was saying 'the British are coming,' but he was actually saying, 'the regulars are coming.' The colonists were still British in 1775." Any visitor--from the devoted history buff to the family looking for a fun and easy day trip--will leave Lexington having learned something new. "We talk a lot about the courage of the people that day," Kauffman says. "We can talk about the things that get overlooked and tell different stories. Guides can bring in the men who are not written about in the history books."